The Valence pavilion is an elegant building perfect for use as an outdoor office or simple entertaining all year round. The pavilion is fitted with a round arch double glazed door. There are four large round arch double glazed windows which provide a large amount of light to the pavilion. 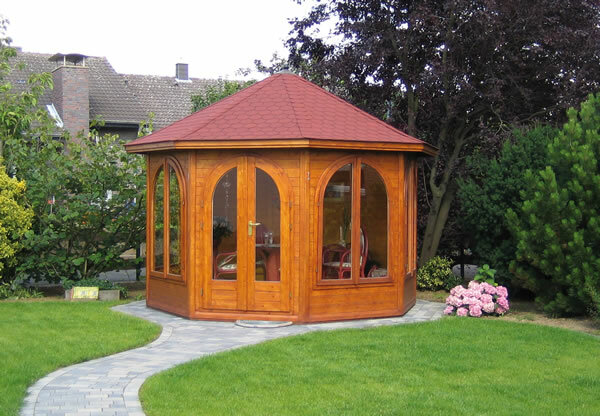 This pavilion is made to order which means there are many options to add your own style for example, extensions, varnish, shingled roof colours, shutters and flower boxes. When felt tiles are selected as the roof covering these are the very best available. Each tile has a fully backed bitumen covering allowing the whole tile to stick down rather than just a small strip.